Place ribs in a large roasting pan, cover with water and bring to boil. Once the ribs are boiling, bring the water down to a simmer for about an hour, or until the meat is tender, but not falling off of the bone. Drain the water, slather the ribs in bar-b-que sauce, cover with foil, and place in the refrigerator for a minimum of 2 hours. While the ribs are in the refrigerator, prepare the glaze by melting the butter in a skillet and then sautéing the onion and garlic in the butter. Once sautéed, place the onion and garlic in a blender along with the vinegar, water, ketchup, and bar-b-que sauce. Set the blender on liquify and blend until everything is a liquid mixture. Place in refrigerator until ready to bar-b-que ribs. 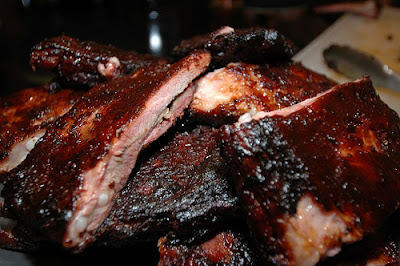 Once you are ready to bar-b-que the ribs, place them meat side up on the bar-b-que, brush glaze all over the ribs, and once done, turn over so that the meat side of the ribs is facing down on the bar-b-que. The flame should be low and you will need to stay with the ribs the entire time so as not to have them burn, they only need to be on long enough to get a nice crispy glaze! Serve with au gratin potatoes, corn on the cob, and bar-b-que baked beans!